Lonnie Wheatley, LITTLE ROCK, Ark. (October 5, 2018) – Current Lucas Oil ASCS National Tour points leader Sam Hafertepe, Jr., kicked off the 31st Annual COMP Cams Short Track Nationals presented by Hoosier Tires by wiring the field in Friday night’s 27-lap preliminary feature atop the high-banked ¼-mile I-30 Speedway clay oval. The Sunnyvale, TX, shoe fended off a pair of Derek Hagar sliders for the point just past midway and went on to take the $2,527 winner’s share by eight car-lengths aboard the Fisher-powered Townline Variety/Heidbreder Foundation Service No. 15h J&J. After tallying the most points through heat race and qualifying race action to earn the pole position, Hafertepe, Jr., outgunned fellow front row starter Hagar for the lead at the drop of the green flag. Hafertepe, Jr., kept Hagar at bay several car lengths back until an inadvertent caution flew after 14 laps. Back into open track, Hagar turned up the heat and slid into the lead briefly in turns one and two on successive laps before the race’s final caution flew for Carson Short with 17 laps in the books. Hafertepe, Jr., worked the middle of the track the rest of the way and slipped away to a safe advantage to secure the triumph. 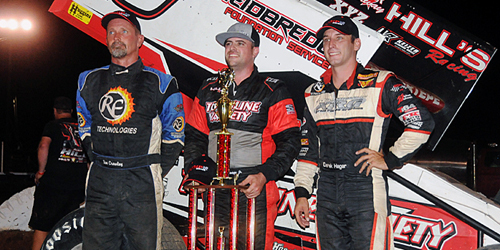 In his wake, Hagar and 1998 STN champion Tim Crawley battled in wheel-to-wheel fashion over the closing rounds with Hagar holding on for runner-up honors aboard his No. 9jr entry. Crawley settled for third in Ronnie Pitts’ No. 1x with Blake Hahn surging past Tony Bruce, Jr., on the 20th round to snare the fourth position. Current USCS points leader Jordon Mallett made his way into fifth in the final circuits, with two-time STN champion Bruce, Jr., crossing the stripe in sixth. Brady Bacon turned in the feature’s top passing performance by rallying from 16th to seventh with Mike Goodman, Morgan Turpen and Canada’s Dylan Westbrook completing the top ten. Cody Gardner, Dustin Gates, Goodman, Marshall Skinner, Howard Moore, Mallett, Westbrook, Bruce, Jr. and Hahn topped heat race action for the 73-car field with Harli White, Chris Martin, Hafertepe, Jr., and Jamie Ball winning the qualifying races. John Carney II and Alex Hill scored “C” Main wins with Matt Covington and Bacon winning the “B” Mains. Jeff Swindell was the first flip victim of the weekend when he got upside down in turn two on the opening lap of the fourth qualifier while Hill took a tumble in turn one on the second lap of “B” Main action after topping her “C” feature. Five-time and defending STN champion Sammy Swindell was forced pitside in heat race action after a bolt came out of the throttle linkage. Swindell rallied from 14th to second in a “C” Main before being involved in the Hill incident in a “B” Main. 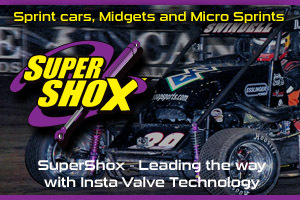 The 31st Annual COMP Cams Short Track Nationals presented by Hoosier Tires at I-30 Speedway concludes with Saturday night’s $10,041-to-win tilt that features a full card of heat races, qualifying races, “C” Mains, “B” Mains and 41-lap STN championship “A” Main along with the Mike Pack Building Materials “Dash for Cash” and “Red Shirt Dash” in memory of Lanny Edwards. Racing action goes green at 7:30 p.m.
First Heat (10 Laps): 1. 88r-Cody Gardner (2), 2. 15h-Sam Hafertepe, Jr. (8), 3. 5x-Tyson Hall (1), 4. 08-Cannon McIntosh (3), 5. 8z-Zach Pringle (7), 6. 31-Justin Webb (5), 7. 58-Gary Floyd (6), 8. 21m-Spencer Meredith (9), 9. 45-Martin Edwards (4). Second Heat (10 Laps): 1. 6-Dustin Gates (3), 2. 99b-Brady Bacon (6), 3. 17T-Channin Tankersley (4), 4. 5-Eric Lutz (7), 5. 44c-Chase Howard (2), 6. D6-Dakota Gaines (5), 7. 12T-Joe Young (8), 8. 24-Kenny Coke (1). Third Heat (10 Laps): 1. 11g-Mike Goodman (1), 2. 95-Matt Covington (6), 3. 45x-Johnny Herrera (3), 4. 10-Terry Gray (2), 5. 84-Brandon Hanks (5), 6. 21k-Kevin Hinkle (7), 7. 10k-Dewayne White (4), 8. 00-Travis Rilat (DNS). Fourth Heat (10 Laps): 1. 26-Marshall Skinner (1), 2. 1x-Tim Crawley (4), 3. 51b-Joe B. Miller (2), 4. 2c-Wayne Johnson (5), 5. 10m-Morgan Turpen (6), 6. 94-Jeff Swindell (8), 7. 91a-Ernie Ainsworth (3), 8. 13m-Chance McCrary (7). Fifth Heat (10 Laps): 1. 40-Howard Moore (3), 2. 21-Koty Adams (7), 3. 57-Cody Howard (1), 4. 1-Robbie Price (5), 5. 44-Jason Howell (2), 6. 72k-Rick Kahler (6), 7. 93-Jake Knight (4), 8. 10k2-Burt Wilson (8). Sixth Heat (10 Laps): 1. 14-Jordon Mallett (3), 2. 23-Seth Bergman (6), 3. 44m-Chris Martin (5), 4. 21x-Carson Short (7), 5. 47-Dale Howard (2), 6. 39-Brad Bowden (4), 7. 12w-Dale Wester (1), 8. 2x-Tucker Doughty (8). Seventh Heat (10 Laps): 1. 47x-Dylan Westbrook (6), 2. 17w-Harli White (2), 3. 2h-Wally Henson (4), 4. 99J-Blake Jenkins (1), 5. 77x-Alex Hill (5), 6. 74e-Claud Estes (3), 7. 12-Scott Smith (8), 8. 32m-Adam Miller (7). Eighth Heat (10 Laps): 1. 86-Tony Bruce, Jr. (3), 2. 9jr-Derek Hagar (7), 3. 5J-Jamie Ball (4), 4. 121-Jan Howard (1), 5. 30-Joseph Miller (2), 6. 94L-Layne Himebaugh (8), 7. 29-Wade Woolsey (5), 8. 3-Sammy Swindell (6). Ninth Heat (10 Laps): 1. 52-Blake Hahn (6), 2. 99-Skylar Gee (8), 3. 17b-Ryan Bickett (4), 4. 44h-Ronny Howard (1), 5. J2-John Carney II (5), 6. 0-Eric Baldaccini (2), 7. 38-Rick Pringle (7), 8. 9$-Kyle Clark (3). First Qualifier (10 Laps): 1. 17w-Harli White (1), 2. 86-Tony Bruce, Jr. (3), 3. 26-Marshall Skinner (2), 4. 23-Seth Bergman (4), 5. 21a-Koty Adams (5), 6. 47x-Dylan Westbrook (6), 7. 08-Cannon McIntosh (9), 8. 1-Robbie Price (8), 9. 94L-Layne Himebaugh (10), 10. 17b-Ryan Bickett (7). Second Qualifier (10 Laps): 1. 44m-Chris Martin (2), 2. 9jr-Derek Hagar (5), 3. 10m-Morgan Turpen (9), 4. 52-Blake Hahn (6), 5. 45x-Johnny Herrera (7), 6. 88r-Cody Gardner (3), 7. 99J-Blake Jenkins (10), 8. 6-Dustin Gates (4), 9. 17T-Channin Tankersley (1), 10. 5x-Tyson Hall (8). Third Qualifier (10 Laps): 1. 15h-Sam Hafertepe, Jr. (6), 2. 1x-Tim Crawley (3), 3. 2h-Wally Henson (1), 4. 51b-Joe B. Miller (7), 5. 99b-Brady Bacon (5), 6. 40-Howard Moore (4), 7. 57-Cody Howard (8), 8. 10-Terry Gray (9), 9. 5-Eric Lutz (2), 10. 121-Jan Howard (10). Fourth Qualifier (10 Laps): 1. 5J-Jamie Ball (1), 2. 11g-Mike Goodman (3), 3. 14-Jordon Mallett (4), 4. 21x-Carson Short (2), 5. 95-Matt Covington (5), 6. 99-Skylar Gee (6), 7. 2c-Wayne Johnson (7), 8. 44h-Ronny Howard (10), 9. 8z-Zach Pringle (8), 10. 94-Jeff Swindell (9). First “C” Feature (12 Laps): 1. J2-John Carney II (2), 2. D6-Dakota Gaines (4), 3. 74e-Claud Estes (6), 4. 84-Brandon Hanks (1), 5. 72k-Rick Kahler (3), 6. 29-Wade Woolsey (8), 7. 24-Kenny Coke (13), 8. 10k2-Burt Wilson (10), 9. 93-Jake Knight (7), 10. 21m-Spencer Meredith (11), 11. 12w-Dale Wester (12), 12. 13m-Chance McCrary, 13. 12-Scott Smith. DNS: 44c-Chase Howard, 47-Dale Howard, 38-Rick Pringle, 00-Travis Rilat. Second “C” Feature (12 Laps): 1. 77x-Alex Hill (1), 2. 3-Sammy Swindell (14), 3. 91a-Ernie Ainsworth (13), 4. 21k-Kevin Hinkle (2), 5. 31-Justin Webb (5), 6. 30-Joseph Miller (4), 7. 0-Eric Baldaccini (8), 8. 9$-Kyle Clark (15), 9. 12T-Joe Young (6), 10. 44-Jason Howell (3), 11. 2x-Tucker Doughty (12), 12. 32m-Adam Miller (13), 13. 10k-Dewayne White (10), 14. 39-Brad Bowden (7), 15. 58-Gary Floyd (9), 16. 45-Martin Edwards (16). First “B” Feature (12 Laps): 1. 95-Matt Covington (2), 2. 99-Skyler Gee (1), 3. 51b-Joe B. Miller (3), 4. 40-Howard Moore (4), 5. 45x-Johnny Herrera (5), 6. J2-John Carney II (12), 7. 6-Dustin Gates (6), 8. 5-Eric Lutz (8), 9. 57-Cody Howard (7), 10. 94L-Layne Himebaugh (11), 11. 74e-Claud Estes (14), 12. 17T-Channin Tankersley (10), 13. D6-Dakota Gaines (13), 14. 1-Robbie Price (9). DNS: 2c-Wayne Johnson, 121-Jan Howard. Second “B” Feature (12 Laps): 1. 99b-Brady Bacon (1), 2. 21-Carson Short (4), 3. 26-Marshall Skinner (2), 4. 88r-Cody Gardner (5), 5. 08-Cannon McIntosh (7), 6. 8z-Zach Pringle (10), 7. 2h-Wally Henson (3), 8. 91a-Ernie Ainsworth (14), 9. 44h-Ronny Howard (8), 10. 17b-Ryan Bickett (11), 11. 99J-Blake Jenkins (6), 12. 10-Terry Gray (9), 13. 77x-Alex Hill (12), 14. 3-Sammy Swindell (13). DNS: 5x-Tyson Hall, 94-Jeff Swindell. A Feature (27 Laps – Starting position in parentheses): 1. 15h-Sam Hafertepe, Jr. (1), 2. 9jr-Derek Hagar (2), 3. 1x-Tim Crawley (6), 4. 52-Blake Hahn (3), 5. 14-Jordon Mallett (7), 6. 86-Tony Bruce, Jr. (4), 7. 99b-Brady Bacon (16), 8. 11g-Mike Goodman (8), 9. 10m-Morgan Turpen (10), 10. 47x-Dylan Westbrook (14), 11. 23-Seth Bergman (11), 12. 95-Matt Covington (15), 13. 5J-Jamie Ball (12), 14. 44m-Chris Martin (5), 15. 99-Skylar Gee (17), 16. 51b-Joe B. Miller (19), 17. 21a-Koty Adams (13), 18. 26-Marshall Skinner (20), 19. 17w-Harli White (9), 20. 21x-Carson Short (18). Lap Leaders: Sam Hafertepe, Jr. 1-27.